PHOENIX (AP) — Christian Yelich has already had conversations with some of his Milwaukee Brewers teammates about their biggest message this spring after coming up one win short of the World Series. "What you did last year means nothing basically. Whether it was good or bad for you as an individual or as a team, it means absolutely nothing. It doesn't matter," Yelich said. "We all start with a clean slate. It's all what are you going to do in 2019 to help the Brewers win." Even for the young slugging outfielder who was the NL MVP after nearly winning the Triple Crown (.326, 36 homers, 110 RBIs) in his first season with the Brewers. Milwaukee's first full-squad workout is Tuesday, four months after losing to the Los Angeles Dodgers in Game 7 of the NL Championship Series. The Brewers made a late-September surge to force a Game 163 tiebreaker, beat the Chicago Cubs for their first NL Central title since 2011 and swept Colorado in the NL Division Series. "It was a little shorter offseason, not much time for vacation," starter Jhoulys Chacin said. "My vacation was being in the playoffs. That was my time to go on vacation in October. That was perfect. We'll take that every year." The core of the Brewers is still pretty much intact from last season, including Yelich, Chacin, speedy center fielder Lorenzo Cain, 35-homer first baseman Jesus Aguilar and hard-throwing All-Star reliever Josh Hader. "As a team, you control your own destiny when you have the kind of talent we do here," Yelich said. "You just want to prove that it wasn't a fluke and that you can do it again. And I think that's the drive, that's the motivation going into the season." Catcher Yasmani Grandal, a free agent addition who was with the Dodgers, is the most notable addition. Right-hander Jimmy Nelson could help the rotation after missing last season because of right shoulder surgery. Manager Craig Counsell said a new season means a new team that hasn't done anything yet. "This is a brand new team with players in different places in their lives, and different places in their careers, different interactions," Counsell said. "I compared it to soup last year. We're going to make the soup again. Some of the ingredients are the same, but there are some different ingredients in that room, and so it's not the same." 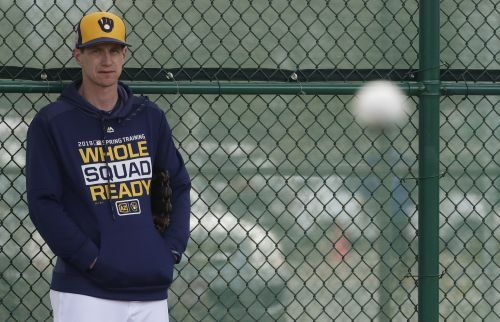 When someone asked Counsell about the idea that it's harder to do something again, the fifth-year manager reiterated what he had already said while sitting in his office just outside the new clubhouse that was part of a $60 million renovation to their spring training complex. "I don't think it matters ... That's my point, is what have we done," he said. "This group hasn't done it." The Brewers haven't been to the playoffs in consecutive seasons since 1981-82 with Robin Yount. They lost to St. Louis in a seven-game World Series in 1982. Chacin, who was 15-8 with a 3.50 ERA in 35 regular season starts, said while the Brewers had a really good season, it hurt missing out on the World Series. "You want to be in that position again, and win that game," he said. Hader said that just boosts the motivation going into this season. "Just the accomplishments that us as a whole accomplished was unbelievable," said the 24-year-old, whose 143 strikeouts in 81 1/3 innings last season set a major league record for a left-handed reliever. "You feed off that, you got the taste of what to get there felt like. But it's not the whole cake. We've still got to finish."